DataHero Inc. has launched a new integration with Google Analytics, giving users the ability to export their data directly into DataHero and start building charts and visualizations, without needing to do any of the heavy lifting themselves. Releasing the integration on Tuesday, DataHero is a self-service cloud platform allowing its users to pull their data into handy charts. The idea is to allow non-technical users to do all of their visualizations themselves, without needing any special knowledge in handling data. Based in San Francisco, Calif., DataHero already has a full slate of other integrations attached to its platform, like Salesforce, HubSpot, Pardot, MailChimp, Stripe, Braintree, Shopify, Box, DropBox, Google Drive, Microsoft OneDrive, and so on. DataHero also allows its users to import data from spreadsheets like Excel and Google Sheets, and on average, it adds three to five new services to its platform each quarter. The company has now turned its attention towards Google Analytics, given a lot of its customers were requesting it, says Chris Neumann, DataHero’s CEO. “Google Analytics is a really powerful tool, but it’s fairly technical. It’s not obvious how to make graphs, and you need to understand it if you want to build different visualizations,” Neumann says, adding that DataHero wanted to take away the mystique of using Google Analytics, especially given it’s such a popular tool. However, he added that DataHero hasn’t integrated with any advertising platforms, meaning users of both Google Analytics and Google AdWords won’t be able to directly link their accounts in DataHero. What’s useful about the Google Analytics integration is that like its other integrations, DataHero has allowed users to combine data sources together, giving them a better view into their business performance. For example, some of the most popular combinations include services and spreadsheets – like the marketer who wants to track leads and sales by combining data from a marketing platform and an ecommerce site. The DataHero platform will then present users with a series of different types of charts. Depending on the kind of data a user will provide, DataHero can show them between six to 10 types of visualizations, like sales across different geographic regions, expected revenue by region, results from month to month, and so on. All of this is automated through machine learning, meaning users don’t need to spend too much time thinking about how to shape their data into visualizations – DataHero does that for them, Neumann says. 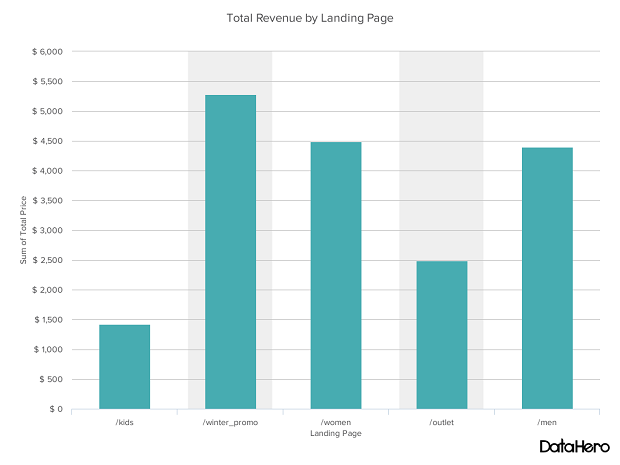 Chart showing total revenue by landing page. (Image: DataHero). DataHero also provides tutorials showing users how they can integrate their cloud providers’ services with its platform. That means that if DataHero doesn’t offer support for a particular service as of yet, users can always export to Excel first, drop it into a cloud storage provider like Google Drive, and then open that in DataHero, giving them the chance to make custom combinations with basically any kind of data contained in a spreadsheet. The goal here is to simplify data as much as possible for the average business user, Neumann says. There’s no extra cost to existing DataHero users for using Google Analytics. Pricing starts at around $49 per month for a premium account, going up to $69 per user per month for a team account. Users of these paid versions can combine as many data sources for their visualizations as they want. However, a free version allowing users to combine two data sources is also available, as the company switched to a freemium pricing strategy in June.